Comment:The processes and timescales discussed in the following article reflect the prevalent scientific viewpoint, but other interpretations of the evidence and timescales have also been put forward. It should be remembered that science is based on inference from observation and quantifiable information. Scientific understanding changes and adapts in response to testable evidence. It is also possible to have several interpretations of the same data. Try to keep this in mind when reading, watching or listening to anything scientific. Solid Geology: Shropshire has some of the most diverse geology of any area of comparable size in the world. 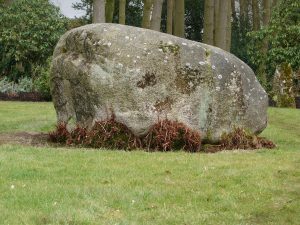 Of the twelve recognised geological periods, the county has rocks representative of nine of them. 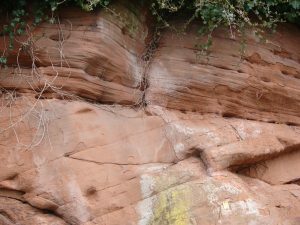 Such is the importance of the geology of the county that many early pioneers of the science, such as James Hutton and Roderick Murchison, came to Shropshire to investigate the rocks. Today, many student, amateur and professional geologists still visit. 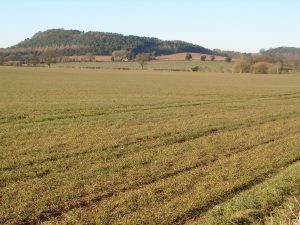 The rocks of the county range in age from the 700 million year old volcanic and metamorphic rocks that make up parts of the Wrekin and Ercall, to those formed at the end of the last glacial period 13,000 years ago. 500 million years ago the parish of Hodnet, along with the rest of Great Britain and Northern Europe, lay at 60° south and was part of a supercontinent called Pangea (whole Earth) which stretched almost from pole to pole. During the last 500 million years, the parish has travelled 12,000 km northwards to its present position at around 52° North. Cross-bedding in Bridgnorth Sandstone at Bridgnorth. This type of rock underlies much of the Parish. The oldest rocks of the parish are of mid Permian age (around 260 million years old). At this time Shropshire lay between 20° and 30° north and the climate was hot and dry, just as the Sahara is today. Horseshoe shaped dunes (bachan dunes) migrated slowly eastwards in the persistent prevailing wind across what is now northern Europe. In the midlands these dunes were ‘fossilised’ to become the bright red Bridgnorth Sandstone. The colour is due to red iron oxide (haematite) that percolated in solution through the sandstone at a later date, helping to cement the sand grains together. This is a highly porous, coarse-grained, lightly cemented sandstone that makes an excellent aquifer. Bridgnorth Sandstone underlays much of the village of Hodnet, eastern parts of Wollerton, Hopton, Hine Heath, Peplow and Little Bolas. Areas of the parish that are largely flat are likely to be underlain by this type of sandstone. Tarporley Sandstone. This is a red and green micaceous sandstone, a large exposure of which is present in the grounds of Hodnet Hall. Helsby Sandstone; a reddish brown sandstone with pebbles. This is the type of rock outcrop that St Luke’s church is built on. Hopley Coppice from the south. Weather resistant sandstones have produced these low hills at the western end of the parish. Marchamley, Kenstone and the north and west of Hodnet are underlain by these rocks. Both of these rocks are relatively hard wearing and have produced the low sandstone hills at the western end of the parish. Around 100 million years ago igneous activity in the area caused hot liquid to be forced through cracks in the sandstones. This left deposits of Barium Sulphate, a white mineral that can be seen in cliff faces at Hawkstone. Deposits of a copper ore (Malachite) were also produced. In the 18th century this was mined commercially in the Hawkstone and Marchamley areas. Marchamley Wood, much of Wollerton and Lostford are underlain by reddish-brown mud-stone. Drift Geology:The geological period that we are currently living in is called the Quaternary. This is thought to have started around 2.6 million years ago and is informally referred to as ‘The Great Ice Age’. During this time the climate has oscillated between extremes on many occasions resulting in ice sheets regularly advancing and retreating across large areas of the northern hemisphere. Cold periods are known as glacial stages and warm periods are called interglacial stages. Strictly speaking we are currently living in an interglacial stage of ‘The Great Ice Age,’ called the Holocene. If the natural cycle of cold and warm periods were to continue, the world’s climate would now be expected to be returning gradually to colder conditions. Scientists believe that there have been up to 20 glacial periods over the last 2.6 million years. However, there is only evidence for three of them in the British Isles. This is because as an ice sheet advances and scours the landscape down to the bedrock, evidence of previous glaciations is removed. The last glaciation reached its peak 18,000 years ago. 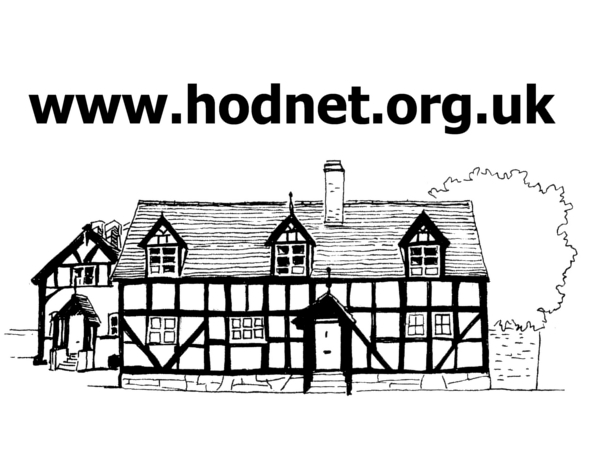 At this time the parish of Hodnet would have been under 1000 metres of ice. Shortly after 18,000 years ago, the climate began to warm relatively rapidly. As ice sheets and glaciers ‘flow’ they grind the rocks at their bases, helped by rocks dragged along by the ice. Rocks transported by glaciers are known as erratics, they vary in size from pebbles to boulders. Erratics from as far away as northern England/Scotland can be found in the Parish. A glacial erratic, dug out of the till. This is a piece of granite originating from the Glasgow area and now rests in the grounds of Hodnet Hall. The processes described above have produced till in North Shropshire. Till is a mixture of sand, gravel and clay. This glacial till now covers most of the Parish and has helped to produce a gently ‘rolling’ landscape in some parts. Other areas are flat, mainly those that are within the flood plain of the River Tern, and have over time had their undulations evened out by river deposits. 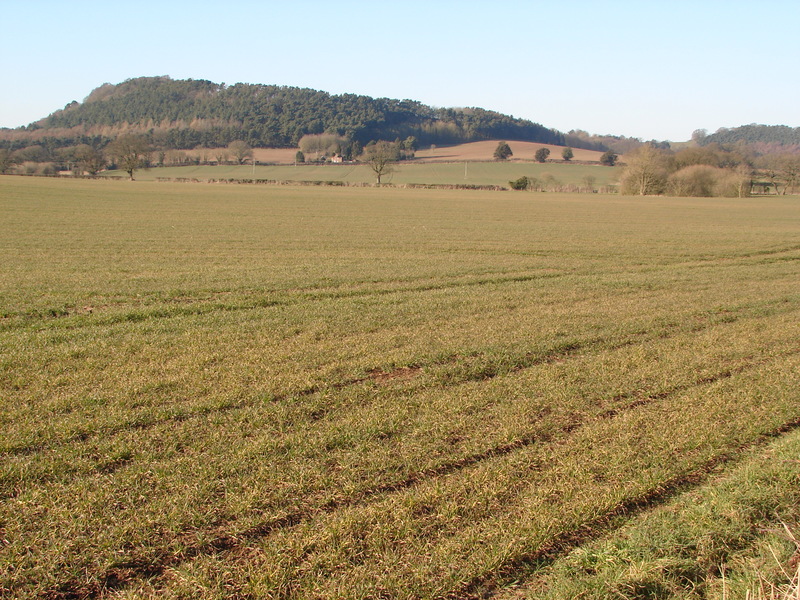 Till, sandstone and river deposits provide the parent material for the soils of the Parish. For this reason soils can vary over relatively small areas, some places being ‘light’ because they are ‘sandy’, others ‘heavy’ due to the higher clay or silt content. Marl, a mixture of clay, calcium carbonate and other minerals, is deposited as glaciers retreat. This material has been dug to use as fertilizer leaving numerous marl pits within the Parish; these pits now make very good habitats for wildlife. Conservation Review Series, No. 24, Joint Nature Conservation Committee. Haines. B. A., Horton. A. (1987, 3rd ed). British Regional Geology, Central England. HMSO publications. British Geological Survey, Map. Mid Wales and Marches, Sheet 52°N 04°W, solid edition, scale 1:250 000. Natural Environment Research Council. Toghill.P. (2006, 2nd ed), Geology In Shropshire. Swan Hill Press.